I’ve never written to an author whose book I enjoyed reading. I probably will in the future. 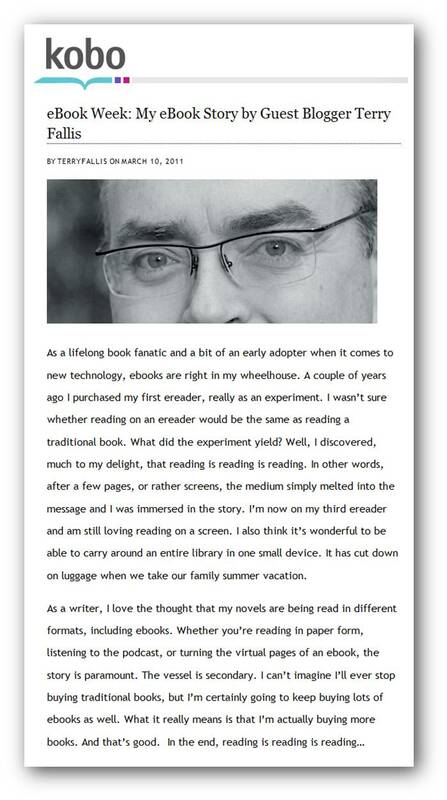 After The Best Laid Plans somehow won the Leacock Medal in the spring of 2008 and was republished by McClelland & Stewart, I started to receive emails and letters from complete strangers who had read and enjoyed the novel. How extraordinarily gratifying. 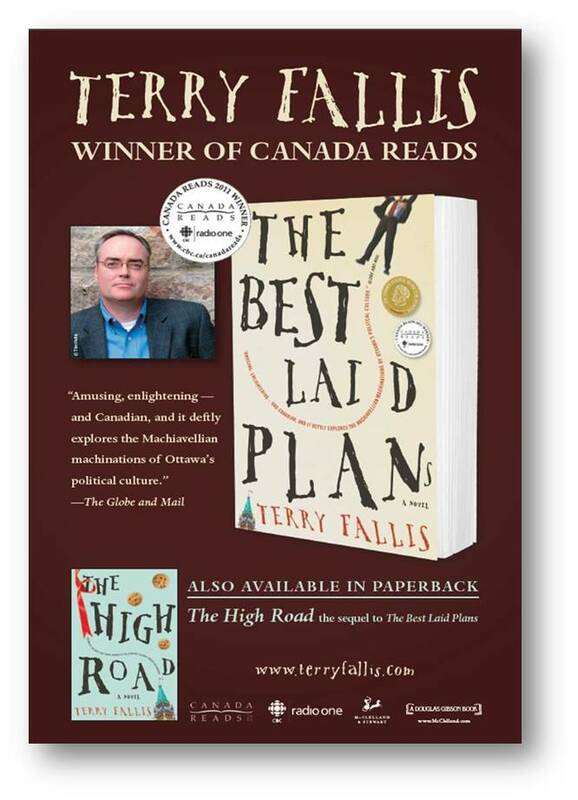 In the wake of the release of The High Road and certainly after TBLP won this year’s Canada Reads, I began to receive one or two emails every day. It is undoubtedly one of the most wonderful parts of being a writer. I respond to every one as if it might be the last. With the added exposure both of my novels have received in the last few months, there have been the occasional negative review in the mainstream media. Were it not for the universally supportive, and downright humbling reader emails, I’m sure I’d be more upset about the odd bad review. These reader messages come to me in several different forms. Most often via email, but also through letters, Twitter, blog posts, LinkedIn, and Facebook too. They serve to remind me that first and foremost, I write for readers, not critics. 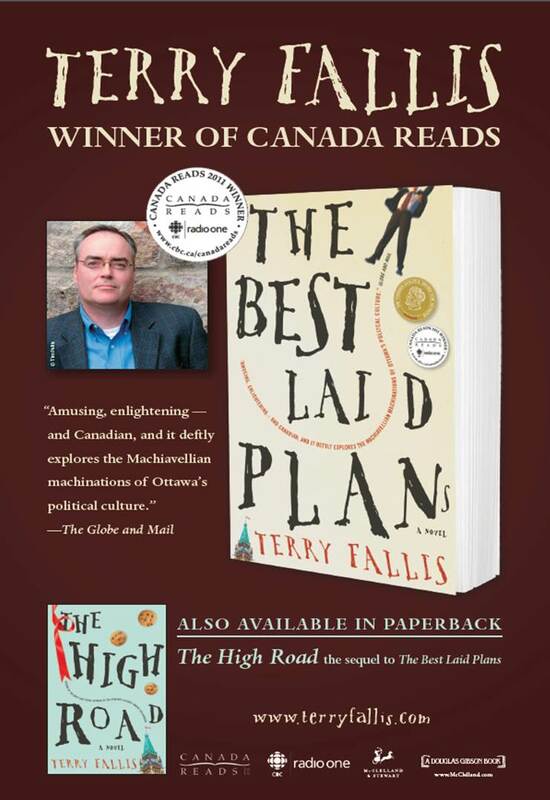 I am a member of the Wednesday Bookclub here in Perth Ontario and yesterday we met to discuss your book, The Best Laid Plans. It was, I am pleased to tell you, a great success. Let me tell you a bit about our bookclub. The club began over 25 years ago. A group of women gathered at Algonquin College for a course about women and literature and had such a great time they decided to continue by meeting twice a month to discuss a book they had agreed to read. At two books a month, you can well imagine that a great number of books have been read. Some have been loved, some liked, some hated and some were considered not having been worth the trouble. There have been about half a dozen considered worth writing to the author about. I joined the group six years ago when I moved to Perth. Four of the original members are still in the group, four of us are new members. A few who have left due to health issues continue to read the books on their own. 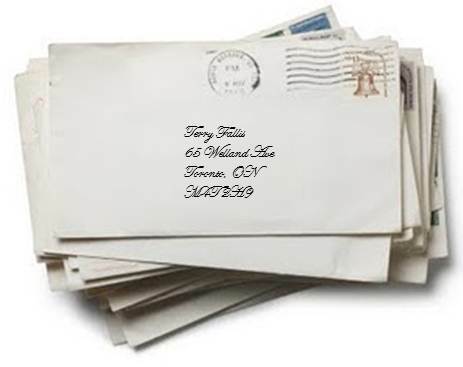 I am pleased to say your book is among the half dozen we liked well enough to write to the author. It was most timely as our discussion took place the morning after the recent Tory budget. What did we like â€“ your inside knowledge about Ottawa and the unique machinations of life â€œon the hillâ€; your very likeable characters â€“ we found them complex, intelligent and well rounded. The timing and pace was wonderful â€“ not so funny as to be â€˜just a good laughâ€ but each of us admitted to laughing out loud while reading. You found that unique balance between cynicism and hope, humour and serious commentary, characters a little over the top but believable. We were especially taken with Muriel and spent a considerable bit of time deciding who was the model â€“ there have been so many wonderful backroom women in Canadian politics. 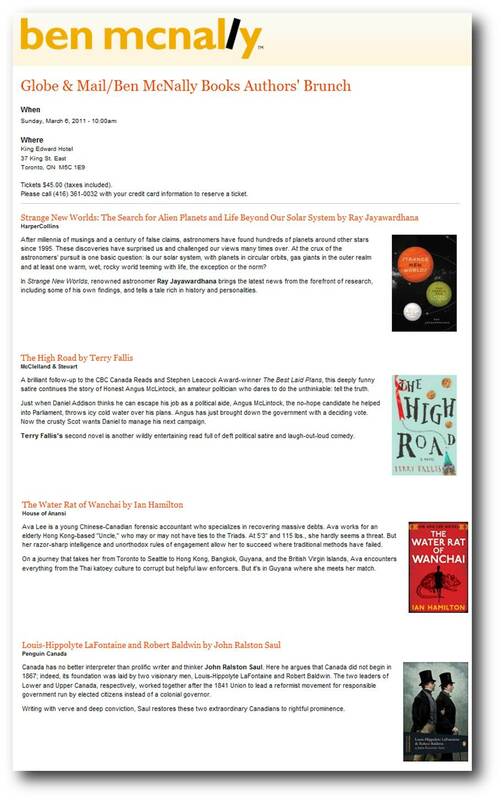 We are looking forward to reading The High Road together. Thank you for a wonderful book on a very timely subject. As the next election looms we hold out hope for an Angus to come knocking at our doors. I’m one lucky author. Check out this poster that will soon be hanging (I hope) in bookstores across the country. 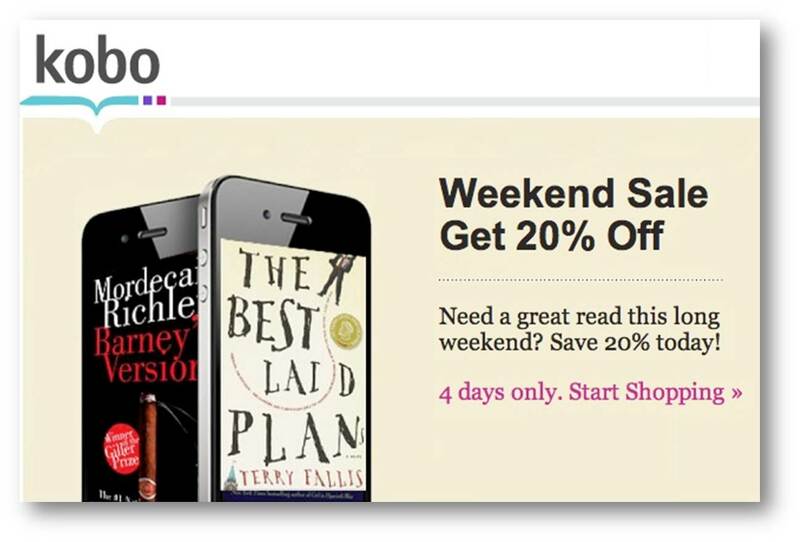 My publisher M&S has created it and it appears that CBC and Canada Reads are in the play on it too. My twin brother, Tim will be pleased with the poster. If you look closely, you’ll see his photo credit in the bottom left corner of the author shot. 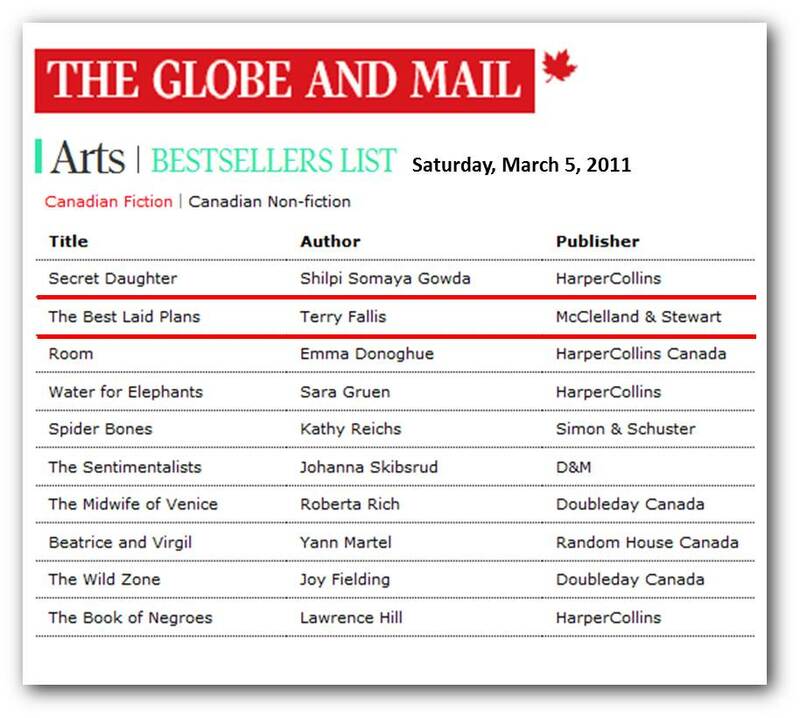 TBLP jumped up to #2 on the Globe and Mail Canadian Fiction Bestsellers List, its highest ranking so far. I don’t think it’ll make it to #1 but I’m over the moon to be sitting at #2 at least for a week. This past Sunday, I was delighted to be one of four writers speaking at a Ben McNally Books Authors’ Brunch in the beautiful King Edward Hotel. Ben has been a strong supporter for many years and I was very pleased to participate and talk about The High Road. The other authors, Ray Jayawardhana, Ian Hamilton,Â and John Ralston Saul, were all fascinating and I really enjoyed meeting them and listening to their stories.Â The event was very well-attended and many books were sold and signed. My thanks to Ben McNally for the invitation and to my intrepid and tireless publicist, Frances Bedford for making the arrangements and giving up a Sunday morning to attend! 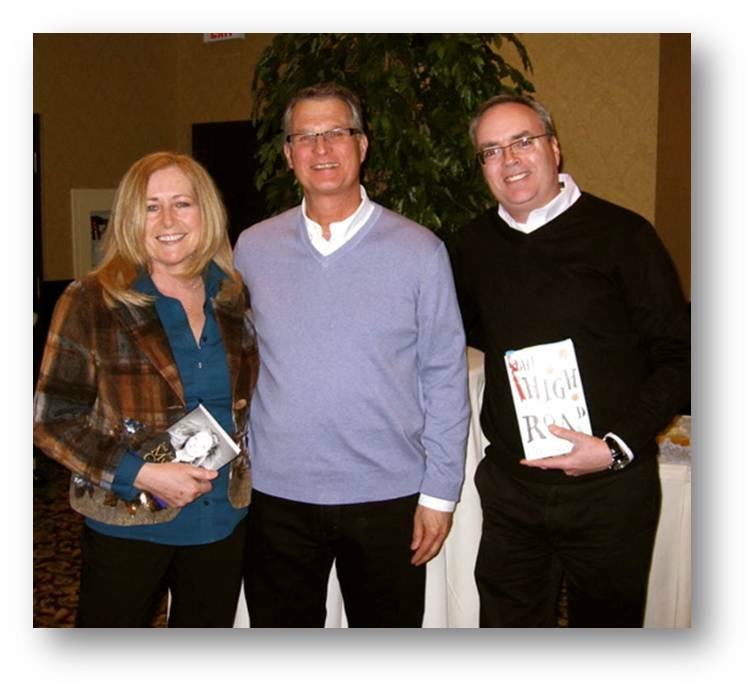 Back in April 2009, I made my first visit to the very popular Grimsby Author Series in the company of one of my literary heroes, Paul Quarrington. I believe it was Paul’s last public reading before he was diagnosed with lung cancer. But neither of us knew anything about that shocking news at the time and it was an amazing evening. Somewhere north of 200 people packed the room at the Casablanca Winery Inn in Grimsby. You can read about my impressions of that special night for me in a post I wrote nearly two years ago. I was honoured to be invited back to read from The High Road last Monday evening. I was joined on the stage by Sue Kenney who read from her wonderful memoir of her pilgrimage along the Camino de Santiago in Spain. Sue read first and had the 230-strong crowd in the palm of her hand. Then it was my turn. The organizer of the event, Ken Boichuk, delivered one of the nicest introductions I’ve ever been given. He was very generous and so articulate. I kind of thought I should just read for a few mintues and then let Ken return to the podium to carry on his captivating talk! Anway, it was a wonderful night with a very warm and welcoming crowd. Sue and I signed a whack of books for audience members afterwards and thoroughly enjoyed ourselves. I’d go back to Grimsby in an instant. (Perhaps for novel number three!) It’s a great reading series with sellout crowds of serious book lovers. 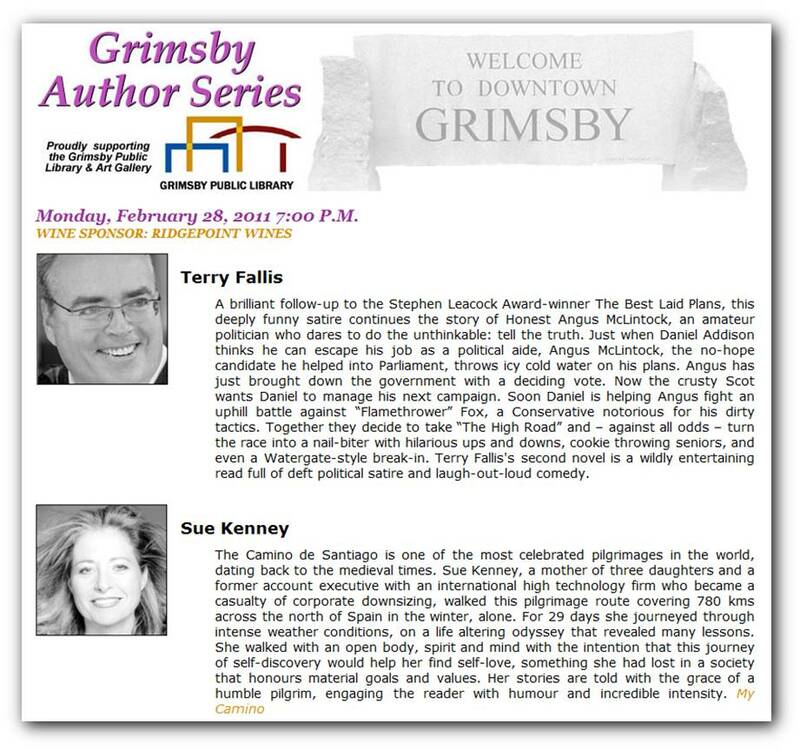 My thanks to Ken, Bud, Eva, the two Nicks, Lita, and all the others who work so hard to make the Grimsby Author Series such a well-known and respected gig for Canadian writers.